One of the great things about Percona Monitoring and Management (PMM) is its flexibility. An example of that is how one can go beyond the exporters to collect data. One approach to achieve that is using textfile collectors, as explained in Extended Metrics for Percona Monitoring and Management without modifying the Code. Another method, which is the subject matter of this post, is to use custom queries. 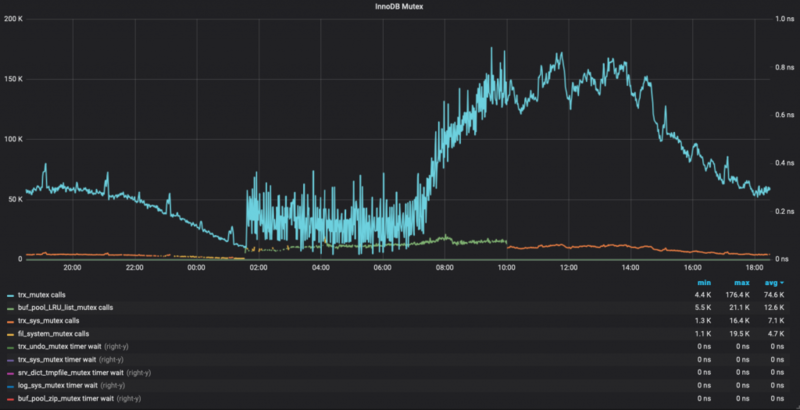 While working on a customer’s contention issue I wanted to check the behaviour of InnoDB Mutexes over time. Naturally, I went straight to PMM and didn’t find a graph suitable for my needs. No graph, no problem! Luckily anyone can enhance PMM. So here’s how I made the graph I needed. Starting from the version 1.15.0, PMM provides user the ability to take a SQL SELECT statement and turn the resultset into a metric series in PMM. That is custom queries. How do I enable that feature? Where is the configuration file located? How often is data being collected? The queries are executed at the LOW RESOLUTION level, which by default is every 60 seconds. query: "SELECT EVENT_NAME, COUNT_STAR, SUM_TIMER_WAIT FROM performance_schema.events_waits_summary_global_by_event_name WHERE EVENT_NAME LIKE 'wait/synch/mutex/innodb/%'"
description: "Name of the mutex"
Remember that this should be in the queries-mysql.yml file. Full path /usr/local/percona/pmm-client/queries-mysqld.yml inside the db node. Once that is done, you will start to have those metrics available in Prometheus. Now, we have a graph to do! These queries are basically: Return the rate values of each mutex event for a specific host. And make some regex to return only the name of the event, and discard whatever is before the last slash character. Once we are good with our PromQL queries, we can go and add the graph. Finally, I got the graph that I needed with a very small effort. The dashboard is also published on the Grafana Labs Community dashboards site. PMM’s collection of graphs and dashboard is quite complete, but it is also natural that there are specific metrics that might not be there. For those cases, you can count on the flexibility and ease usage of PMM to collect metrics and create custom graphs. So go ahead, embrace PMM, customize it, make it yours!